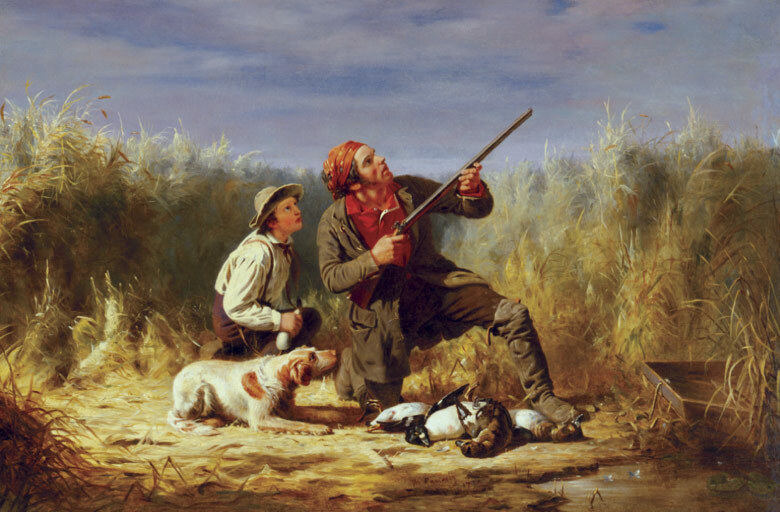 Afield in America: 400 Years of Animal and Sporting Art, the inaugural exhibition in the new Museum is designed to raise awareness of the importance of animal and sporting art as a reflection of American history and cultural life. Over one hundred outstanding works of fine art representing every category of the genre have been selected to show how American animal and sporting artists developed a unique national style reflective of the diversity of our people, the rich variety of our wildlife, and the breadth of our national landscape. Paintings and sculpture have been drawn from the NSLM’s permanent holdings, as well as from private collections, museums, and other institutions throughout the United States. The exhibition is curated by F. Turner Reuter, Jr. and based on his 880-page reference book, Animal and Sporting Artists in America, which was published by the National Sporting Library in 2008. Reuter’s book is being reprinted this year. The inaugural exhibition is intended to raise awareness of the importance of animal and sporting art as a reflection of American history and cultural life. Designed to attract the widest possible audience, Afield in America presents works by iconic American artists such as Albert Bierstadt, Thomas Eakins, Alfred Jacob Miller, and Frederic Remington, as well as those by recognized masters of the animal and sporting art genre, including John James Audubon, Paul Manship, Edward Troye, Arthur Fitzwilliam Tait, and William Tylee Ranney. The works of other fine American sporting artists, which have long been esteemed by enthusiasts of the genre, but until recently were often overlooked by art historians, are an important focus of the exhibition. This group includes: William Herbert Dunton, Herbert Haseltine, Thomas Hewes Hinckley, Anna Hyatt Huntington, Alexander Pope, Ogden Pleissner, Percival Rosseau, and John Martin Tracy. An illustrated, color catalogue accompanies the exhibition; critical essays explore larger interpretations of these works with the objective of defining the remarkable role animal and sporting artists have played in the history of American art. Essayists include: William H. Gerdts, Ph.D, art historian and author of Art Across America; Adam D. Harris, Ph.D, Curator of the National Museum of Wildlife Art and author of Wildlife in American Art; Daniel J. Herman, Ph.D, historian and author of Hunting and the American Imagination; F. Turner Reuter, Jr., Curator of Afield in America and author of Animaland Sporting Artists in America; and Robin R. Salmon, author and Vice President for Collections and Curator of Sculpture, Brookgreen Gardens.